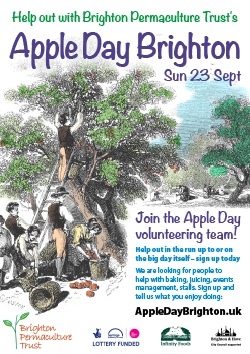 Apple Day Brighton is our biggest annual event, and we need your help! Apple Day is a harvest celebration held in the autumn each year. It forms Brighton Permaculture Trust’s main annual free public access event to promote the charity, the permaculture ethos, provide resources and information and outreach to the Brighton and Sussex community. The event draws over 7000 people to Stanmer Park to enjoy orchard tours, apple juicing, entertainments, stalls, and lots of yummy food and drink, including our very own Stanmer Scrump. We need a team of 50 to 100 volunteers to help us run the event. One of them could be you! Given the size of the event and our experience of previous years, we are also now asking in advance for help the day before and the day after. You don’t have to work all three days. You can tell us which days you want to work, and whether you want to work in the morning or afternoon. You can also specify the tasks you prefer. Setting up the park the day before is a lot of work and absolutely vital for the smooth running of the event on Sunday. The more help we have, the quicker we can get it set up! Tasks include supporting the scrump team, preparing fresh apple juice, setting up the cafe and other stall spaces on the green, putting up signs/decorating, and so forth. On the day of the event, we will need help across all areas, from juicing apples to helping in the cafe. The sign up form itself lists some of the our main needs, and we particularly appreciate it when people tick the box that says ‘help wherever needed,’ as it does give us more flexibility in planning. As with all of our courses and events, we could not run this successfully without your help. It does require enthusiasm and commitment to make this event happen, and we really hope you’ll rise to the occasion and join us! No experience is necessary, and new volunteers are very welcome. If you sign up to help on any of these days, please put them in your diaries. It would help us immensely if you make sure you are free before signing up to help – the smooth running of the event relies on your turning up! If, for any reason, you find out you can’t make it, do try to let us know well in advance. We really need to have a good reliable set of volunteers in place in advance of the event in order to plan and organise rotas and jobs. We are a very small team, but, with your help, we can be a very big team that will really make a difference in the running of this event! We have lots of other opportunities in the run up to the event and the day after too, all volunteer opportunities can be viewed here. There are other volunteering opportunities with us throughout the year, including fruit picking around the time of Apple Day. Sign up as a volunteer to find out about these opportunities.